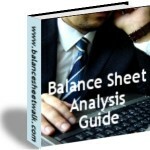 The Balance Sheet Analysis Guide is available for purchase. This is an e-book (pdf). Prices is in Australian dollars. Click the Purchase now button to pay in other currencies. GST, VAT or Sales tax: Customers in Australia will have GST added. Customers elsewhere may have Sales Tax, VAT or GST added as required by your country’s laws. The final price will be shown before confirmation. Purchase using a credit card or PayPal. Enter your Name and Email and click the Purchase now button. If you have a PayPal account use your PayPal email to facilitate processing.